"So, you're making a pot of tea for friends? 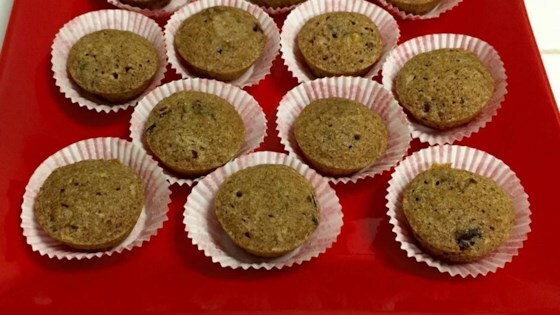 Add a nutritious snack with these easy, spicy mini-muffins." Preheat oven to 350 degrees. In a large bowl, beat egg whites until stiff. Fold in applesauce, half-and-half and vanilla. In a separate bowl, combine Splenda, flour, baking soda, spices. Fold dry ingredients into wet mixture. Fold in pineapple, cranberries and nuts. Spoon batter into non-stick mini-muffin pans greased with cooking spray. Bake 12-15 minutes. Remove, cool. Dust with confectioner's sugar if desired. Used sugar instead of splenda, all-purpose flour only, didn't have pumpkin pie spice so subbed with cloves & nutmeg, and left out the pineapple. These were a hit & very moist!